Will Politician in Advani Make Way for Leader in Him? For a party whose ideology could have never struck a chord with the soul and idea of India, to have grown into a formidable opposition and then cruised into power as the chief constituent of NDA (National Democratic Alliance) BJP had done remarkably well. The architect of this miracle was L K Advani. Vajpayee, the then prime minister and earlier leader of opposition has had the charisma but Advani had the math. He was not what he pretended to be but he knew what he needed to be perceived as his concocted image and he sculpted it accordingly with impeccable dexterity. But his image served his party more than himself. As the party grew and Vajpayee drew benefit off a liberal image only he could have afforded Advani had begun to measure the heights or depths of sacrifices he had made for party and his own climb. Unfortunately climb was never absolute. It had to stop after certain ascend and it did. The valiant soldier of party fell victim to its success. Vajpayee on the other hand relished the endearing persona and prime ministership (first proposed by Advani) that came with it. When Advani was striving hard to become indispensable for his party Vajpayee was conceiving a deportment to be acceptable across India. Both succeeded. But while acceptability came with its rewards, indispensability brought with it an expiry date. Advani, the shrewd politician and an overwhelming human being was now a hardliner. Hindutva, the crutch of core values he chiseled for BJP’s rise and his ascend began to prick in the armpits. And then begins the frustrated efforts to break free of the crutches and walk free quite like Vajpayee. That was never to be. He proclaimed Jinnah to be a secular messiah in Pakistan and hoped to cultivate a ground for him among India’s Muslims. But for us the events that unfolded brought on what Advani ought to have tried hard from being divulged. The man who had engineered the era of formidable opposition in Indian democracy was made to lick what he had spat by the bosses sitting on the fence. He turned out to be a sheepish pushover as if leaving Advani, the leader, behind in Pakistan. On that day he had lost a battle in full view of Indian republic. No longer was he Advani who had immediately offered to quit in Jain-hawala charges till exoneration. The image loving Advani tried creating many. He began with Sardar Patel and ended up with being Jinnaized. The self proclaimed iron man image borrowed from Patel only proved disastrous. The layers of images had him crushed in between the illusions. Different versions of images for different audiences: party, minority, RSS, corporate and nation. Jinnah had running through him a Manichean personality. Both were miles apart from each other. Political compulsions arisen out of personal ambitions and turn of events led him to his final entitling. Advani too tread the same course. Today he is carrying the burden of so many deeds he knew were everything but compatible to his character. His assessment is not wrong. His back is burdened and bent but he feigns health. His deeds brought him to power. A myopic vision cleared the path for him and then ditched. Jinnah for all the re-readings he is enjoying still retains the disposition that throws him to us as conceiver of two nation theory along religious lines. 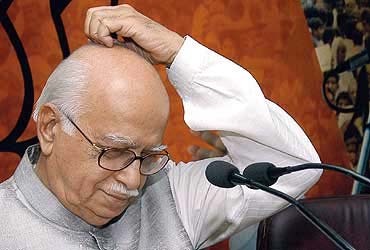 Advani too Jinnahized his laconic comportment when he set out to his infamous Rathyatra to contribute his bit in polarizing the nation along religious lines and presiding over an ignominious act. RSS or Sangh as he calls it may have been propagating a theory to establish Hindu India for long but it was Advani who gave it the direction and recognition in India’s middle class. And hence the formidable presence in parliament. Thanks to him a significant chunk of India’s NRI’s were more interested in constructing temples than schools in the nation of their origin. The dust raised by Rathyatra is settling now to the ground. Slogans are no longer to be heard. New voters prefer it that way. Settled dust, paved roads. Today he is not man of moment but the hub of lament. A political career that parallels Independent India which had begun from the deserts of Rajasthan now risks playing its denouement with a spat with a Rajasthani. An octogenarian living his beginning once more. The longevity of any career derives much of its strength from key moments and in politics more so. If these moments are handled well memory and history take care of rest or the baggage grows exponentially. Vajpayee had his share of weak moments. He didn’t out rightly seize them but he did not let them become his albatross. Is it not ironic that today Kandhar is a failing ascribed to Advani only not Vajpayee too. In his memoirs My Country My Life Advani writes that he was initially against the release. But later states that “the government most reluctantly took the option to minimize the losses.” In all his interviews he had often denied having any knowledge of Jaswant Singh going to Kandhar to swap militants with hostages. Prevarication at best. Now ballistic Jaswant and cash-for-votes controversy revisit him to his utter embarrassment. Ghosts are far too many to be exorcized. The ghosts that have him rendered noncurrent to his party are of his own making. The Kanadhar fiasco which is embarrassing him to the extent of being termed mendacious is the outcome of having morals shaken at the first fear of possible cracks in the image he thought he wore. Jinnah controversy could easily have been handled if it were not for his spinelessness and election defeat could have been used for even enhancing his persona by retreating back and letting the shadow talk further. Sometimes shadow proves to be more powerful because people can osmosis into it without bruising it. The author Malcolm Gladwell describes in his book “Blink” a concept which he calls "thin-slicing" i.e. our ability to gauge what is really important from a very narrow period of experience. In other words, spontaneous decisions are often as good as—or even better than—carefully planned and considered ones. Gladwell also mentions that sometimes having too much information can interfere with the accuracy of a judgment. This he calls "Analysis paralysis.” Advani had his “thin-slicing” moment but he let go of it. Once gain he is being castigated for being a devoted soldier of the party. What made him stay we had better not speculate in reverence to the old man but one glance at BJP sans his presence and gloom drips. My hunch is perhaps in this castigation of Advani lies the hope for BJP. Now that he has put himself to pasture let’s talk future. Sangh is believed to be preparing for his grand superannuation. He has choices. He can shut himself up once and for all or he can establish a communion with public. He will be listened to. If he is old then he also has age on his side. Advani has a past, a chequered one. A past where most often the politician in him bruised and sometimes even killed the leader in him. Strange as it may seem but still he is not all past. He still has it in him to birth impressions of future. He wanted to be a prime minister. He couldn’t. Politicians are always recognized by the posts they hold. Leaders are not. If his last shot was at the top job then he will be remembered as politician. If he can transcend the range of his effort and straighten the burdened back he will go down in history as leader. Will he make it?